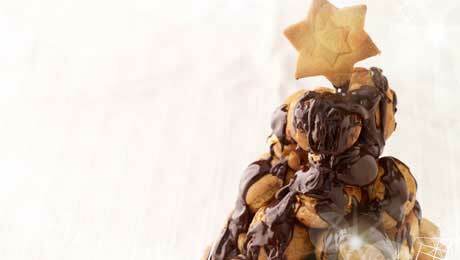 If cakes and pudding aren’t your thing, then why not give our profiterole Christmas tree a go? It’s much easier than it looks to make and your guests will be very impressed! Pour the water and milk into a saucepan and add the butter. Bring to the boil, remove from the heat and immediately add the flour. Place the saucepan over a low heat and stir vigorously with a wooden spoon until the mixture leaves the side of the saucepan and forms a smooth ball (approximately 5 minutes). Allow the mixture to cool slightly then add the eggs one at a time beating thoroughly after each addition, until the mixture is smooth and glossy. Fill a piping bag with a large nozzle with the cooled mixture and pipe walnut sized pieces onto parchment lined baking trays. Bake in the oven for 30–45mins (profiteroles are cooked when they are golden brown and have no moisture in them). Place a hole in each profiterole using a skewer (to release steam) and scoop out any moist mixture or your profiteroles will collapse, you’ll use this hole to pipe the cream in once the profiteroles are completely cooled. Fill a piping bag with whipped cream and pipe cream into your profiteroles. To melt the chocolate: Place the chocolate in a bowl over a pan of simmering hot water. Once melted remove the pan from the heat but allow the bowl to remain over the hot water as the chocolate needs to be melted as you build your tree. Dip each profiterole into melted chocolate and begin building your ‘tree’ on your serving plate, starting by building your base and working up from there. If your kitchen is warm, you may find it helpful to place in the fridge at regular intervals to help each layer set. Finish by pouring over the melted chocolate. Decorate with simple star shaped biscuits for a truly impressive dessert.